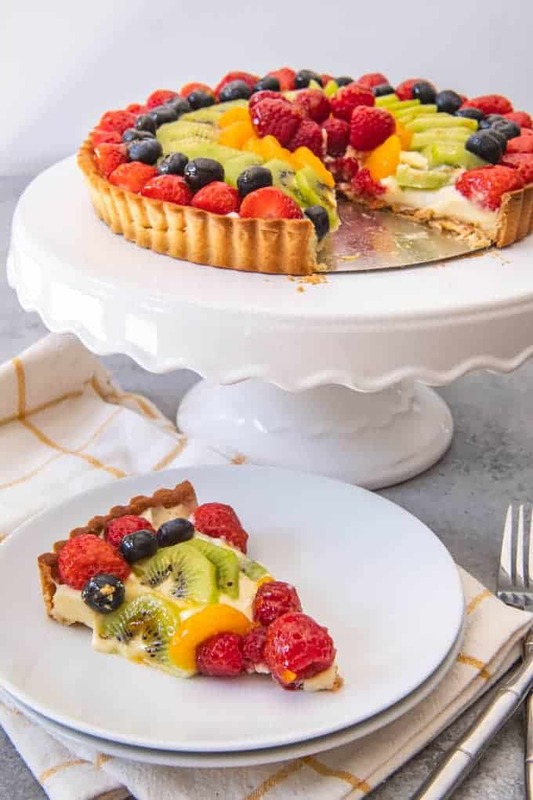 Fresh, colorful, and bursting with juicy fruit, rich pastry cream, a deliciously sweet pastry crust, and an easy fruit tart glaze, this French fruit tart recipe makes a showstopper dessert that is perfect for Spring & Summer! If you have ever been to Paris, chances are those stunning jewel-colored fruit tarts displayed in the windows of every patisserie (aka French pastry shops) caught your eye. As much as I love chocolate croissants, baguettes, macarons, and crepes, of all the foods I tried in France, it was their fruit tarts that were my favorite over anything else. The thing I’ve missed most back home. French fruit tarts are a wonderful dessert idea for entertaining, especially with the upcoming berry season when fresh berries and other fruit are at their best! This month’s H.O.N.E. Monthly Cooking Challenge is to make tarts! Sweet or savory – it’s your choice! 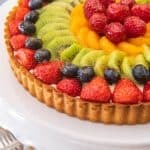 I’ve got my favorite, traditional fruit tart recipe for you to start with, but I’m also including a few other ideas toward the end of this post if you want additional inspiration. A tart is a sweet or savory dish made from pastry dough with a firm, crumbly crust. Tarts are typically baked in a pan with shallow sides and a removable bottom since they only have a bottom crust, and are unmolded before serving. You can use almost any fruit you like to create a French fruit tart! In Paris, you will see strawberry tarts with whole strawberries standing on end, raspberry tarts with piles of delicious red or golden raspberries, or mixed fruit tarts like this one that I made with strawberries, blueberries, sliced kiwi fruit, mandarin oranges, and raspberries arranged in a decorative pattern over the vanilla pastry cream. But blackberries, peaches, cherries, or almost any other fruit you can think of would be delicious with a sweet, shortcrust tart crust and creamy, silky pastry cream. Don’t assemble your French fruit tart too early before serving as the pastry crumb will start to soak into the crust over time. I think it’s best when the tart is eaten within 1 to 2 hours of filling the tart shell. There is a work-around I saw where you can melt a little chocolate and spread that in the bottom of your baked tart shell, then let it set to create a barrier between the crust and the filling to keep it from getting soggy, but it’s not something I have tried myself. However, since all of the components of the fruit tart can be made in advance, assembly is actually pretty quick and easy. 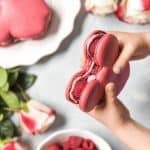 It’s a great make-ahead dessert idea that is especially fun for entertaining because of how impressive and beautiful they look! What is Pâte Sucrée (also known as a Sweet Pastry Crust or Shortcrust Pastry Dough)? The tart crust recipe I use for my French fruit tart is called pâte sucrée in France. But don’t let the fancy name throw you! Pâte sucrée is just a sweet pastry crust that is actually easier to make than pie dough. 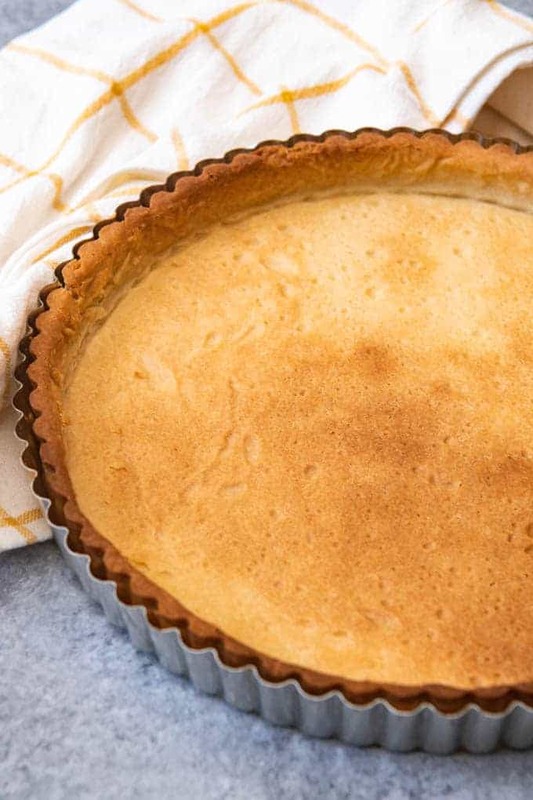 This buttery, sweet tart crust is actually more of a firm, crumbly shell with an almost cookie-like texture, as opposed to pie crust which is known for being flaky and light. My sweet tart dough recipe calls for powdered sugar rather than granulated sugar, which gives it the unique, melt-in-your-mouth yet sturdy texture that really sets it apart and makes it the perfect vessel for holding the delicious vanilla pastry cream and loads of fresh fruit that we are going to fill it with. 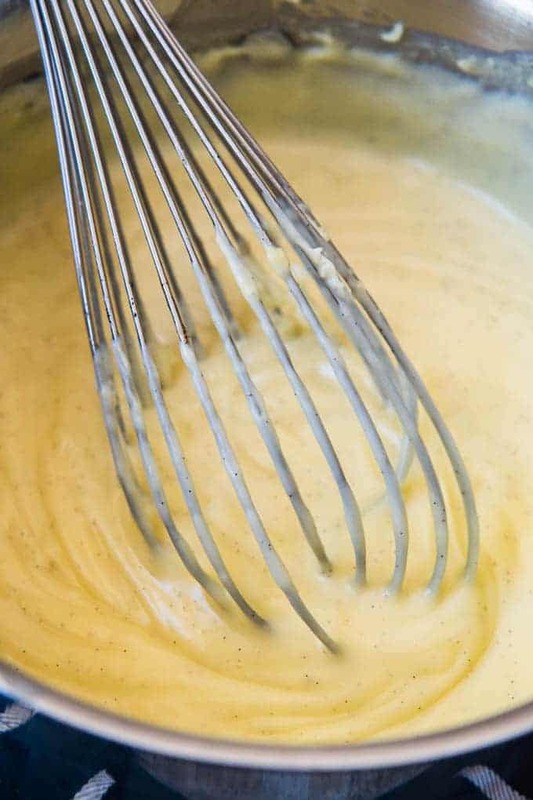 Combine the egg yolk, cream, and vanilla together in a small bowl and whisk together with a fork. 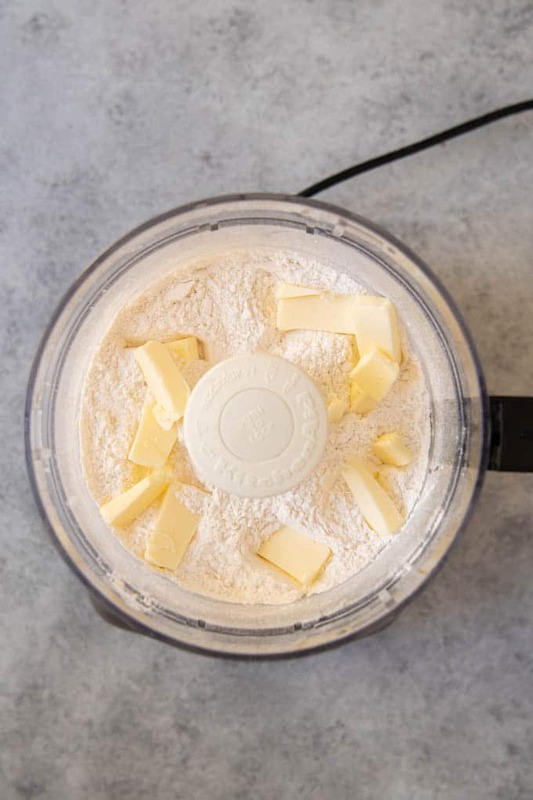 Using a food processor, cut the butter into the flour, powdered sugar, and salt until it resembles coarse crumbs. Slowly pour the liquids into the flour mixture while the food processor is running and let it process until it begins to come together. Remove the tart dough and flatten it into a disc, then wrap in plastic wrap and chill for at least an hour in the fridge. When the dough has chilled, roll it out on a lightly-floured surface into a circle slightly larger than your tart pan (mine is a 9-inch pan but I think this could also probably fit a 10-inch pan), then gently lift it over the pan and press into the corners and fluted sides, running a rolling pin over the top to cut off any excess dough. Freeze the tart shell for 30 minutes, then press a double layer of foil into the tart shell and fill with pie weights. 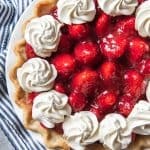 Here is a helpful resource with step-by-step pictures about how to blind bake a tart crust using pie weights. Bake for 30 minutes at 375 degrees before removing the pie weights and foil and baking for another 5 to 10 minutes, until golden. Pastry cream (also known as crème patissière) is a thick, creamy custard with a silky smooth texture that can be used for filling cakes, tarts, cream puffs, eclairs, and other desserts. 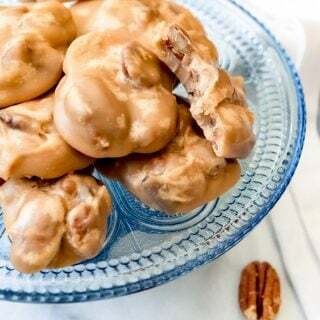 It was actually the component of this dessert that I felt most intimidated by having attempted a few different pastry cream varieties in the past that were either too thick, too gummy, or just plain too bland. 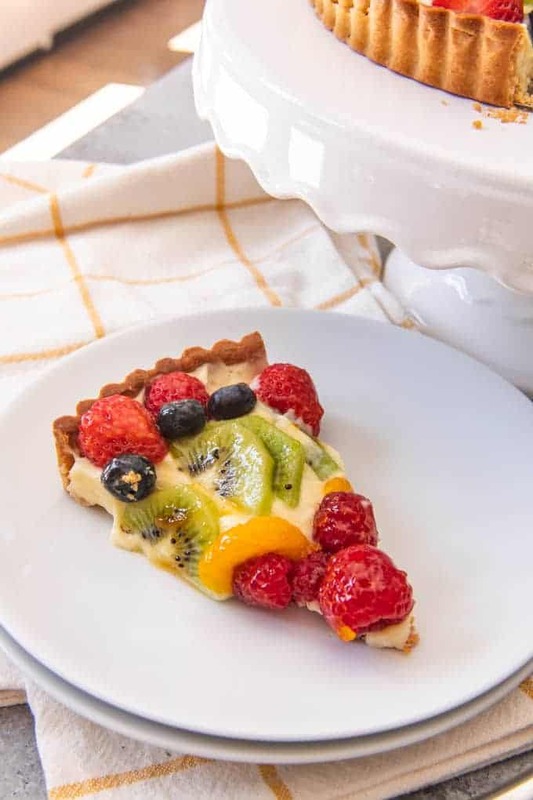 That’s the tricky part about pastry cream – it needs to be tasty on it’s own, but it also needs to be a team player in this dessert so as not to override the brightness of the fresh fruit or sweet, buttery crust. 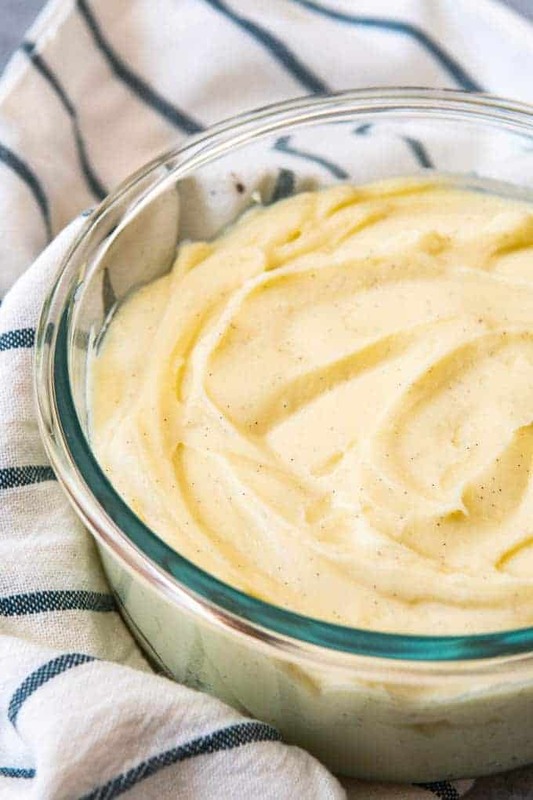 Pastry cream is made with milk, cream, sugar, salt, cornstarch, egg yolks, butter, and vanilla for flavoring (although you could use different extracts to change it up in other desserts). I actually use Nielsen-Massey’s vanilla bean paste instead of plain vanilla because I love the flecks of vanilla bean in the pastry cream, although the same thing can be achieves by using actually vanilla beans and infusing them with the milk and cream at the start of the cooking process, then scraping out the seeds, or you can just use regular vanilla extract if that’s what you have on hand. Bring the milk and cream to a simmer in a medium saucepan with half of the sugar. It doesn’t need to boil and it doesn’t take long. Medium-high heat will do the trick in less than 5 minutes. While the milk mixture heats, whisk together the sugar and cornstarch in a bowl so that it is evenly combined. Then whisk in the egg yolks until the mixture is light and creamy. When the milk is hot, temper the egg yolks by slowly pouring half of the hot liquid in to the yolks, whisking constantly. This will keep the egg yolks from scrambling when added to the pan. Pour the tempered egg yolk mixture into the pan with the remaining liquid, reduce the heat, and continue to whisk constantly until the pastry cream is thick and a few bubbles start to pop on the surface, then remove from the heat. Stir in some cold butter and vanilla bean paste (or an equal amount of vanilla extract). And that’s it! Transfer to a shallow pan or a bowl and lay plastic wrap directly on top of the pastry cream so a skin doesn’t form while it cools. Then cool completely in a fridge for 3 hours before using. This step is so easy, but a fruit tart glaze was missing from many of the fruit tart recipes I looked at when researching how to make this lovely French dessert. I knew from my time in Paris that the tarts there absolutely glisten in the patisserie shop windows, so I had be sure my recreation of a French fruit tart had the same jewel-like quality. And really, all that is used to glaze a fruit tart is a warmed up, light colored jelly or jam that gets gently brushed on to make the fruit shine. Although I also like the extra little bit of flavor it adds as well. Apple jelly or apricot preserves are my favorite options for a fruit tart glaze, although I’ve seen other sources call for red currant jelly. You won’t use the full amount called for in the recipe, but I find it’s easiest to heat up half a cup of the preserves or jelly just until warm and stirring until it is smooth. Then just dip a pastry brush into it and dab it on the fruit decorating your tart. Combine the milk, cream, and half of the sugar in a medium sauce pan over medium-high heat, stirring occasionally until the liquid comes to a simmer. As the liquid heats, whisk together the remaining sugar, salt, cornstarch, and egg yolks in a medium bowl until light and creamy. Once the milk mixture is hot, slowly whisk about 1 cup of the liquid into the egg mixture to temper the yolks. 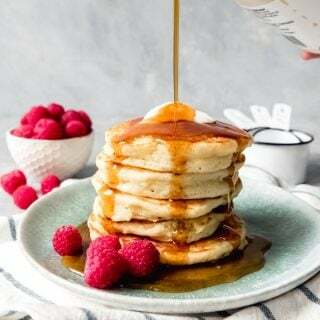 Pour the tempered egg mixture back into the saucepan with the hot milk mixture and reduce the heat to medium, continuing to cook while whisking constantly, until thickened and a few bubbled burst on the surface, about 30 seconds. Remove the pastry cream from the heat and whisk in the butter and vanilla, then transfer to a bowl and cover with a sheet of plastic wrap placed directly onto the surface of the pastry cream so a skin doesn't form. Refrigerate until chilled and firm, about 3 hours. 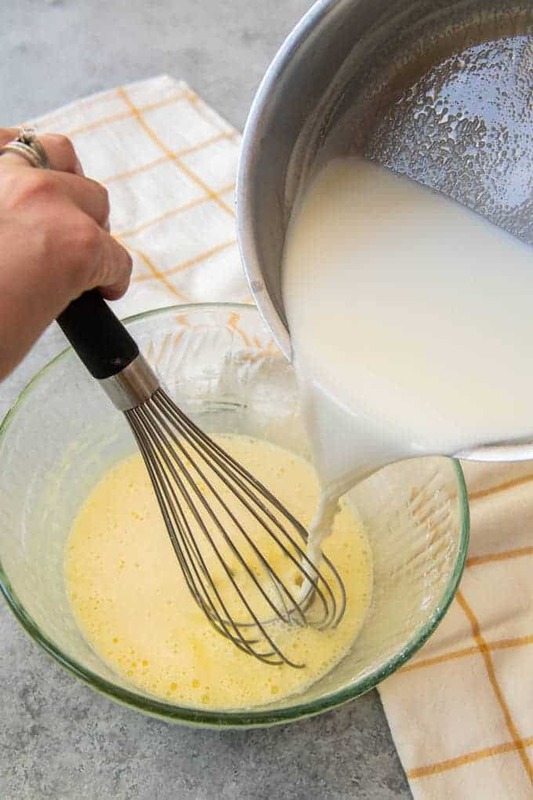 Whisk together the egg yolk, cream, and vanilla in a small bowl. Combine the flour, powdered sugar, and salt in a food process and briefly process to combine. Add the cold butter pieces to the flour mixture and pulse to cut into the flour until the mixture resembles coarse meal, about 15 pulses. While the food process is running, add the liquid through the feed tube and continue to process just until the dough comes together around the blade. Turn out the tart dough onto a sheet of plastic wrap and flatten into a 6-inch disk, then wrap it tightly and refrigerate for 1 hour. Let sit out on the counter for 10 minutes to soften slightly before rolling out. Roll out the pastry crust on a lightly floured surface until it is slightly larger than your tart pan (mine is a 9-inch pan). 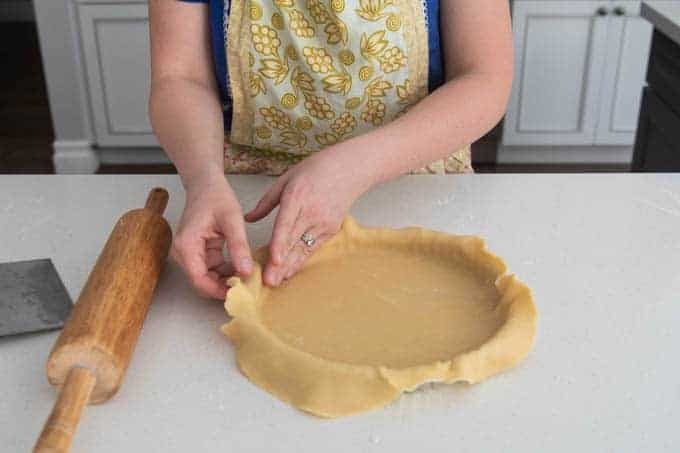 Carefully transfer the dough to the pan by rolling it onto the rolling pin, then gently easing the dough into the pan, pressing into the corners and fluted sides of the pan. Run the rolling pin over the top of the pan so that the excess dough gets cut off on the edge of the pin, making a clean edge. Patch any edges that are too thin with excess dough, trimming away the edge again as necessary. Freeze the tart shell for 30 minutes. When ready to bake the tart shell, heat oven to 375 degrees F. Press a double layer of foil into the frozen tart shell, covering the edges of the pan and filling the tart shell with pie weights. Bake for 30 minutes, rotating halfway through, then carefully remove the pie weights and foil and bake another 5 to 10 minutes, until the tart shell is fully baked and golden. Cool completely before filling. When the tart shell is completely cooled, spread the pastry cream over the bottom of the shell. 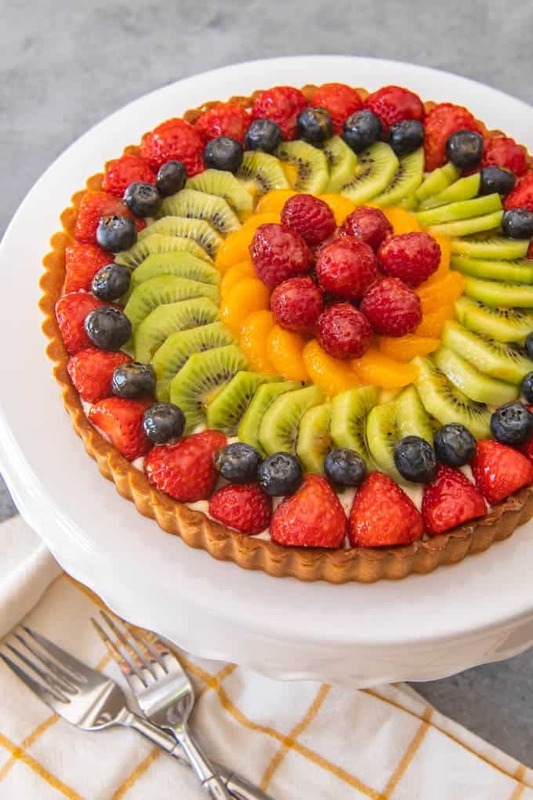 Arrange the fruit in a decorative fashion over the cream, overlapping the sliced kiwi or mandarin oranges, and mounding raspberries or blueberries in the center of the tart. Melt the jelly or preserves in a small saucepan or the microwave, stirring until smooth. Use a pastry brush to gently dab the melted jelly over the fruit. You may not use all of the jelly. Slice and serve. You could also use 2 cups half-and-half in place of the whole milk and cream, or 1 1/3 cup skim or low-fat milk with 2/3 cup heavy cream. If you do not have vanilla bean paste, you could just use regular vanilla extract instead. I’d love it if you FOLLOWED House of Nash Eats on INSTAGRAM | PINTEREST | FACEBOOK | TWITTER. 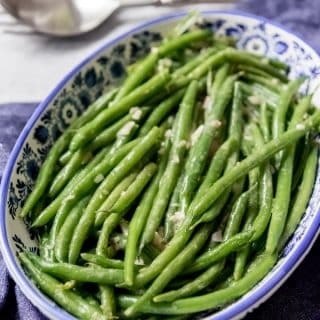 If you try this recipe, please rate it and leave a comment on this post. Getting feedback from you helps me and other readers too! And if you’re on Pinterest, feel free to leave a comment and photo there if you have one! Also, if you share on INSTAGRAM, use the hashtag #houseofnasheats and tag me (@houseofnasheats) so I can stop by and give your post some love. Thank you!!! Like what you see here? Be sure to sign up to join my mailing list so you don't miss out on more recipes like this one! This looks divine! 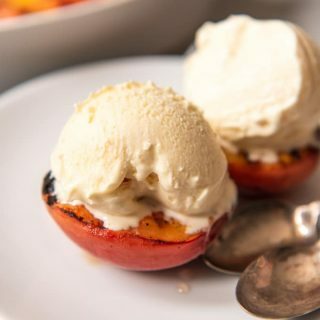 It’s simple, classic flavors and I want it right now!! 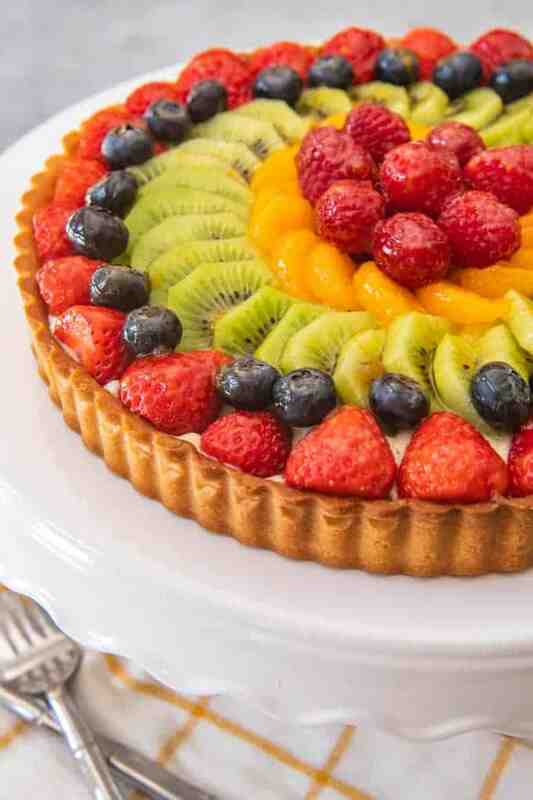 Your fruit tart looks absolutely stunning! This would be a showstopper at any dinner party or gathering. I really appreciate the detailed directions you included for each step of the tart as well! It’s been a long time since I made French Fruit Tart. When my kids were younger they would have it often because they love pastry cream. This looks so pretty. This looks amazing! 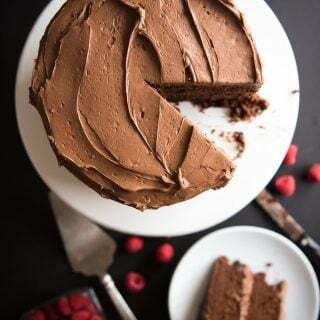 I love the idea of added the chocolate layer to keep it from getting soggy…I would have never thought of that. It’s tasty! I had it that way but haven’t tried it myself before as I always tend to make my tarts fresh and don’t need the extra layer. i had a similar tart for my birthday and LOVED IT. I am so happy to see this homemade version which I need to recreate it soon. Wow! This looks so delicious! I love a good tart, but haven’t made one for many years!! Your beautiful fruit tart has made me want to get back into the game of tart making!! Years ago, when I was just starting out with my husband, I bought one of each type of pan that was available at a discount store. One of those pans was a tart pan. I’ve never used it, but your post has inspired me to do so. I love all of the instructions that you’ve provided to make certain that my final result will turn out right. 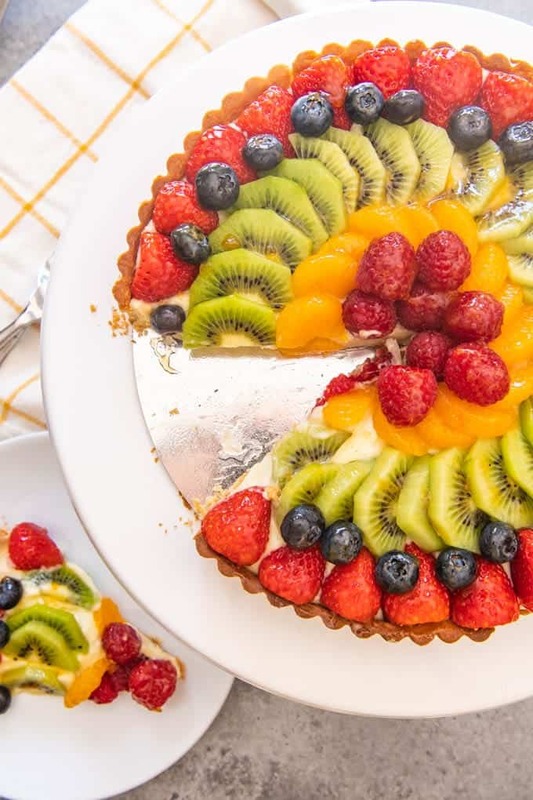 The only problem is that this fruit tart is almost too pretty to cut and eat. It’s like a work of art. Honestly? French and fruit in the same dessert title? Say no more. I am trying this ASAP. Going to test drive it for myself and my husband first and then surprise my ma for Mother’s Day! I have been to France a few times and my eyes always drew to the pastry cases as we walked by any pastry shop. Everything looks so good and tasty. So does this. I ate a wonderful fruit tart a few weeks ago and have been craving another one ever since. Your pastry cream looks absolutely perfect – can’t wait to bite into this! Even in Italy this fresh fruit tart is present in every bakery, pastry shops and everybody love it. I made it for my husband’s birthday, it is a showstopper. Yours look wonderful And your tips and pictures are so helpful. Your tart looks delicious and your presentation is gorgeous! I definitely want to give this a try and your step-by-step instructions make it seem so easy! This is one beautiful looking tart! This is something I would not normally attempt to make, but your instructions make it sound less intimidating! this looks SO freaking good! when I was a little kid my Mum and I used to go to our local French bakery and get mini french fruit tarts, this looks gorgeous! I LOVE fruit tarts so much. 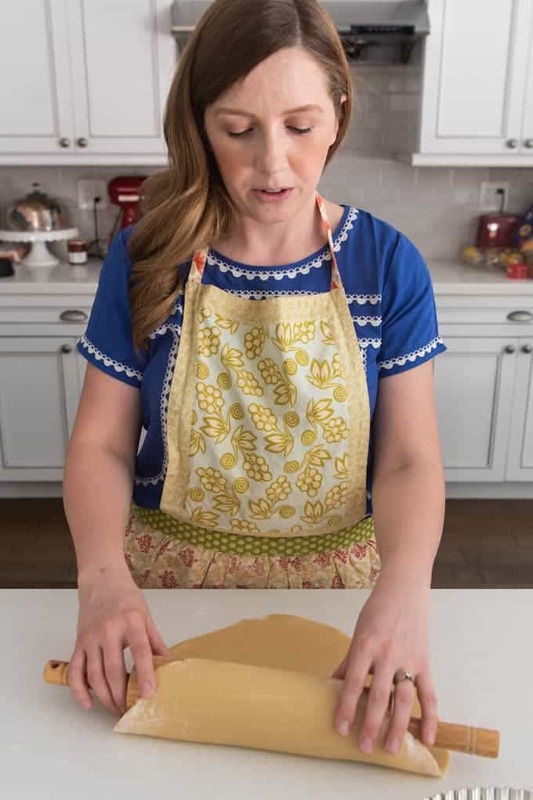 I love your tips for making the perfect shortcrust and fruit options! Super gorgeous! That’s the size I have as well! You will be fine! 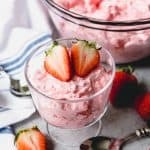 I am trying this recipe but do not have a food processor. Do you think a blender(like I would use for smoothies) would do for the dry ingedients in the crust, and then should I switch to a mixer (like I would use for cookie dough)? Thank you! I can’t wait to try! I haven’t tried it, but I think it should work even without switching to a mixer. I would just add the liquid on a low speed until things start to come together and try not to overmix, which would be the biggest concern using a blender. Hi, when I slice the assembled tart, the fruits start sliding off and it becomes somewhat messy looking. May I know if it’s normal for this to happen? Thanks! Yes, that can happen since the pastry cream is very soft. Some helpful tips are to make sure the fruit is small enough that you aren’t slicing through the fruit and to also use a very sharp knife. I press directly into the tart and slide the knife off being careful not to use a sawing approach, which will also destablize the look of each slice. But in truth, once the tart gets sliced it just won’t look as beautiful. Mine was very runny. Should I cook the pastry cream longer? I have just made this and mine was extremely runny as well! As soon as I cut it, it basically fell apart. I’m thinking if more corn starch would have helped it. That’s too bad! I really don’t think more cornstarch is the answer because you don’t want a thick, gummy pastry cream. I would recommend cooking it a little longer and make sure you are measuring your liquids correctly. OK, so I made this a couple of weeks ago to impress my Italian man and his family on his 30th birthday. No pressure, they only run an Italian restaurant! It was so worth the effort, everyone loved it and the feedback was even that it was better than some of the cakes in the restaurant. So thank you! Your comment made my day! 🙂 I’m so glad it was a hit with everybody! This looks excellent and will make it for my dinner party in December. Can I use liquid vanilla instead of the paste? Yes, just use an equal amount. Hi Amy, I ended up doing the tart today and it was excellent. 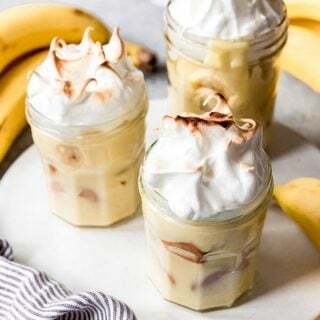 Thank you so much for sharing this great recipe. The only problem is that my pastry cream was too runny. Should I cook it longer next time? Yes, chances are it just needed a little bit longer to thicken a bit more. Timing can take a bit longer if the heat of the stovetop is a bit lower too. Yes my pastry cream also was too runny and just poured off the slice and tart with the berries. I followed the recipe exactly. I’m sorry to hear that! I’m guessing you either needed to cook it longer or just forgot to add the cornstarch to thicken it. Hi Am y – looks amazing and got the thumbs-up approval to serve on Xmas. However, to minimize potential issues, I’m guessing a pre-purchased short crust pastry would work in place of making my own? Absolutely you could use a premade crust! Great recipe! I did put a thin layer of chocolate between the crust and the pastry cream. No soggy crust and adds a bit of decadence with the chocolate. Wow! I tried all different pastry creams and this by far is the best. What a great tart too! Nice touch with the powdered sugar. Makes all the more so difference. I’m planning to make individual tarts for my new year party. Can I use this recipe? This is a very good recipe! I made individual tarts and my guests loved them. They were all gone. My husband was impressed! My first batch of tarts burnt a little because I forgot to adjust the time since im baking them individually. But they still tasted ok. The pastry cream is so delicious and went well with the fruits. This recipe is definitely a keeper! Thanks! Says to cool the custard (which will harden in fridge). Then once shell is done, pour custard into shell. Huhhh???? You can’t pour hardened custard. How is it supposed to look appealing if hard custard is placed into shell? It will be uneven and sloppy. Can you please explain if there is a mistake in directions and how to properly our custard into the shell? The custard doesn’t harden and the instructions indicate to spread it, rather than pour into the shell. It’s pastry cream and has a wonderful smooth texture that spreads beautifully into the prepared shell. I hope that helps! What liquid and quantities go in the pasty dough? The recipe doesne’t Say and I’m at that point? Help!! Hi Kim – I’m not sure what you mean? All the ingredients are listed in the recipe. There is no additional liquid needed beyond the egg yolk and cream for the tart shell. Made it tonight. Thank you for this recipe it was so very good 😊 wish it would allow me to post a picture of the one i made. Making this right now. Everything is setting in the fridge. Do I spray my tart pan? First time making a tart. No, you don’t need to spray the tart pan. 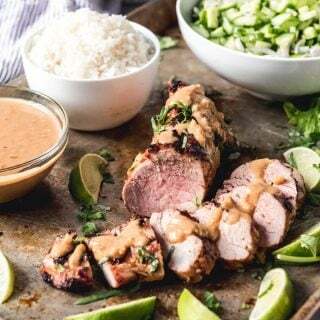 This recipe looks amazing and I may try it tonight for a family party! What are your thoughts about making a graham cracker crust in a tart shell instead of the short crust pasty? My thoughts are that sounds delicious! Obviously not traditional for a French fruit tart, but I LOVE graham cracker crusts and am positive it would taste fabulous. You are so welcome! And thank you SO much for sharing on social media! That means so much to me, you have no idea! I loved this fruit tart!! I’ve made pasty cream many times, but this recipe in particular I felt was the best pasty cream I’ve ever made. The combo of fresh berries and cream is to die for. I substituted the pasty crust for a traditional graham cracker crust and thought it turned out amazing! Overall very quick and easy with the graham cracker crust… highly recommend this recipe! I will be making again! I’m so glad you loved it! And the graham cracker crust is a great idea for a non-traditional fruit tart! I’m going to have to try that one too! Hi Amy, your tart looks delicious, do you think I can susbstitute the whole milk for evaporated milk ? Evaporated milk is richer and creamier than regular milk. I think you could try but I honestly can’t say what the result would be like (although it might be amazing and crazy delicious!). I’ve also heard of substituting 1/2 evaporated milk and 1/2 water for the same amount of whole milk in recipes (but again, haven’t tried it in this recipe). I made this tart yesterday in a 6″ tin. I just halved all the ingredients, and adjusted the baking time for the crust accordingly. I had to cook the cream for 3-4 mins until it thickened, and it stayed put on tart slices. I did struggle with the pastry as it turned out to be very short, it kept falling apart while handling. But overall, everything was delicious and refreshing. Oh dear! Yes, mine is a 9-inch pan. I will make a note of that in the post. I tried your recipe, it was absolutely amazing and actually well described and easy to follow. Thank you for posting it. I did not realize it was this easy! I wish I would have tried making this years ago! I only used half a vanilla bean, next time I’m using a whole one. It was not as intense as I would have preferred. Thank you! If you’d like to use a photo of mine, you are welcome to use one photo, as long as you link it back to the original post. 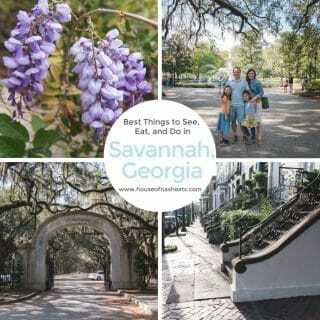 Please let me know if you use a photo and definitely feel free to pin on Pinterest! Please do not republish (verbatim) one of my recipes, unless you contact me in advance for permission. If you use one of my recipes as a source of inspiration for your own, please let me know – I’d love to see it! You can get in touch with me at amy@houseofnasheats.com.